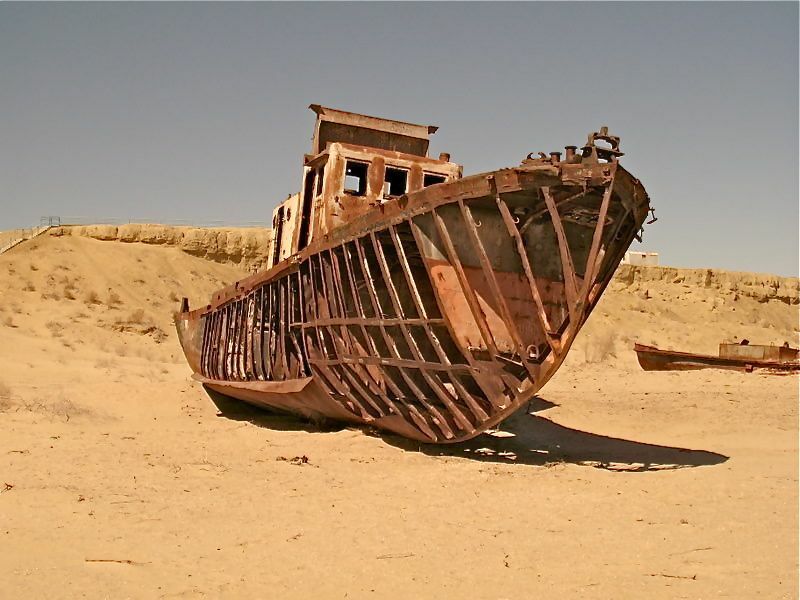 The Aral Sea was once one of the four largest lakes in the world, situated between Kazakhstan in the north and Uzbekistan in the south. 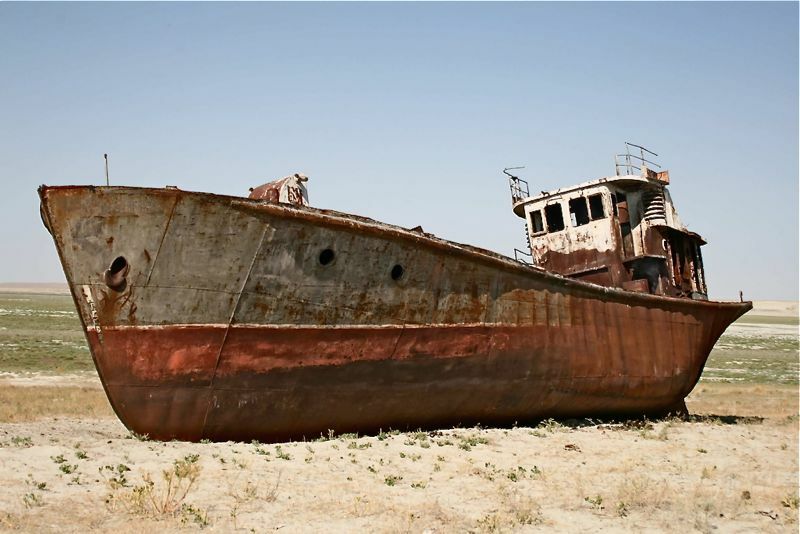 In the 1960’s the Soviet Union redirected its tributary rivers into irrigation projects, and as a result by 2007 it had shrunk to 10% of its original size. 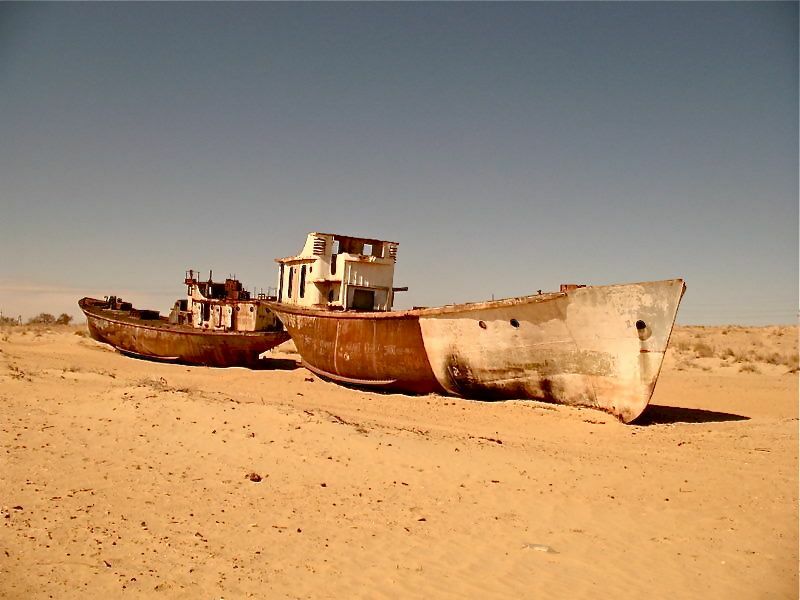 Once prosperous fishing towns like Muynak were left stranded miles from the retreating waters, their boats high and dry on the salt-encrusted desert sand. 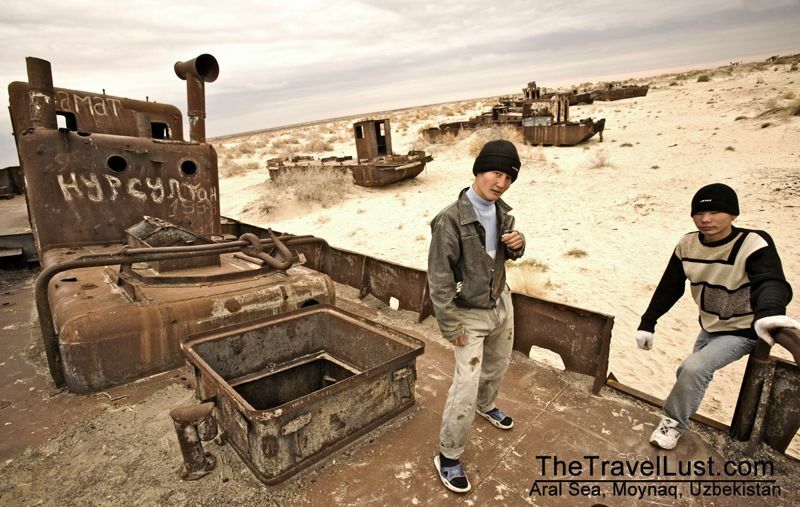 ‘Aral Sea’ roughly translates as “Sea of Islands”, referring to more than 1,500 islands that once dotted its waters. It had an area of 68,000 square kilometres, now split into three much reduced lakes around the edges. The whole region is also heavily polluted, with consequent serious public health problems. The retreat of the sea has also caused local climate change, with summers becoming hotter and drier, and winters colder and longer. 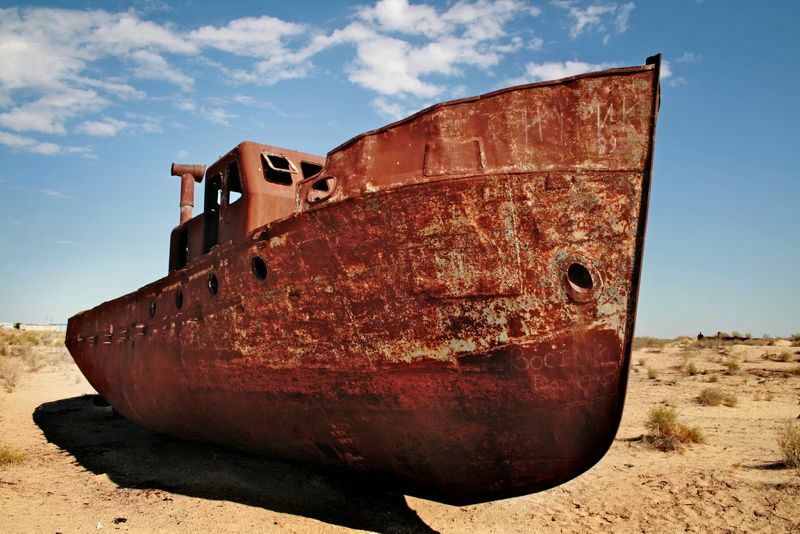 There is now an ongoing effort in Kazakhstan to save and replenish the North Aral Sea. As part of this effort, a dam project was completed in 2005; in 2008, the water level in this lake had risen by 12 metres from its lowest level in 2003. Salinity has dropped, and fish are again found in sufficient numbers for some fishing to be viable. 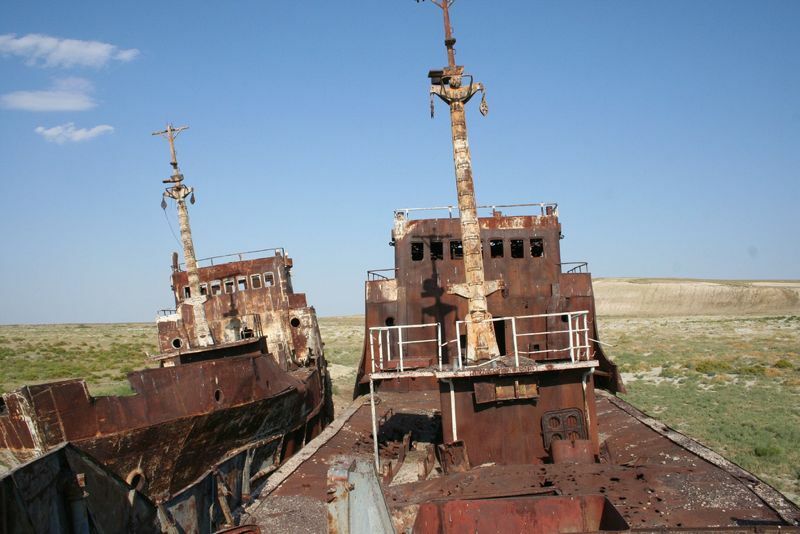 However, the outlook for the remnants of the South Aral Sea remains bleak. 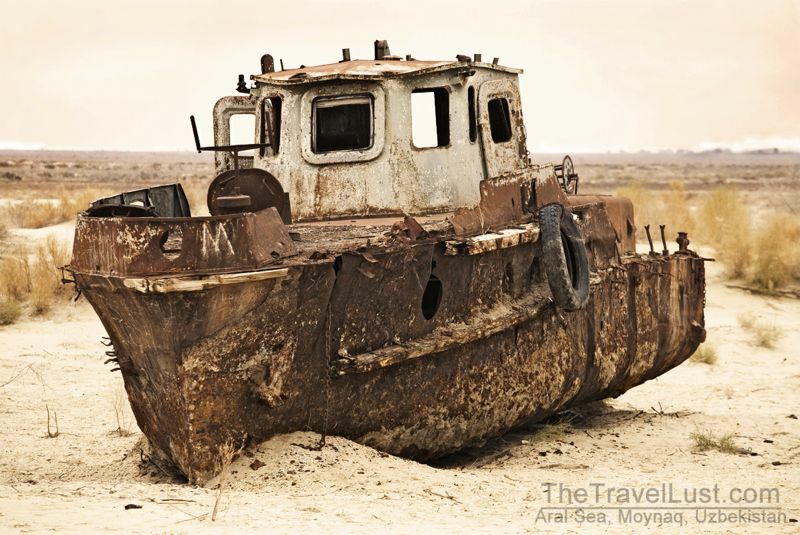 It has been called “one of the planet’s worst environmental disasters”. It was a hectic morning for us. We shipped out of Muynak three hours before the dawn, and a sharp Uzbeki wind swept us far over the Aral. First mate Alisher worked the rigging, Nursultan primed the nets, and I set us on a course to drift towards the Pamir flow. Salt water sprayed over the starboard bowsprit and I watched the eastern skies lightening. Somewhere back there was my wife and our children, still asleep. By mid-day I would be home, and scraping the stink of fish from my skin. I must have fallen asleep. I lift my head from the wheel and it crumbles beneath me. I look at my hands, they are red with rusted metal. 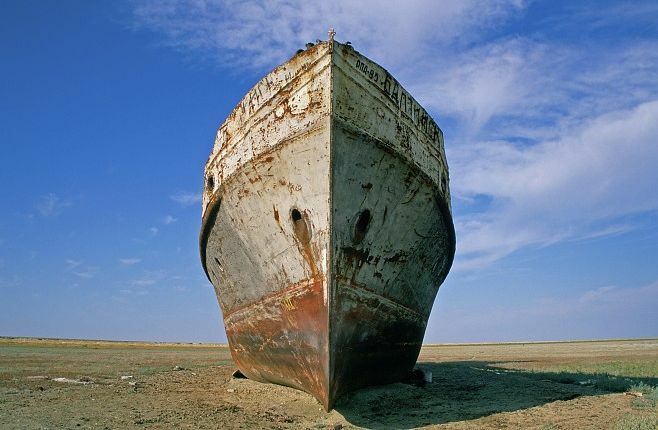 Beneath them the decking has rotted through, and I am looking into the sand-filled depths of the hull. I take a panicked step backwards and stagger, barely catching my balance on the rotten bow railing. “Alisher!” I call out. “Nursultan!” There is no answer. I look out, and see that the sea is gone. Now there is only endless sand, spreading all about me, scattered with the hulking wrecks of other ships. I am alone. 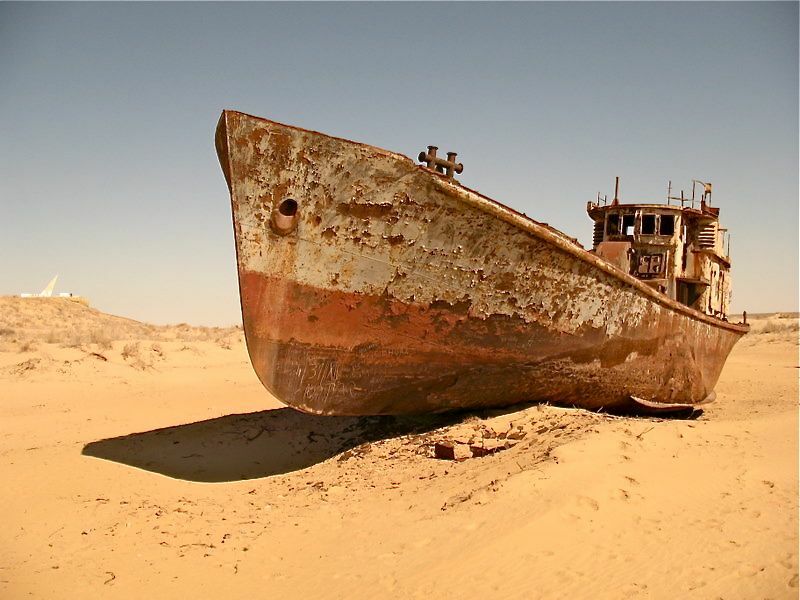 I’ve always been fascinated by deserts, and the prospect of ships lying on the desert floor where once there had been a sea takes that interest to the next level. On that note, one of my favorite books is Wolf in Shadow by David Gemmell. It follows the ‘Jerusalem Man’, a Bible-quoting gunman who wanders the deserts searching for the lost city of Jerusalem, killing bad guys like a Wild West sheriff as he goes. The world he lives in has experienced a ‘second Fall’, where the oceans tipped from their basins and covered the land, leaving what was once the ocean floor exposed to the air. He stumbles across the skeletal rib cage of a huge whale and wonders what kind of beast it was. He sees the Titanic itself, stuck in a mountain cleft. I love that sort of thing, the ultimate exploration of a world once wholly off limits. I heartily recommend the book. 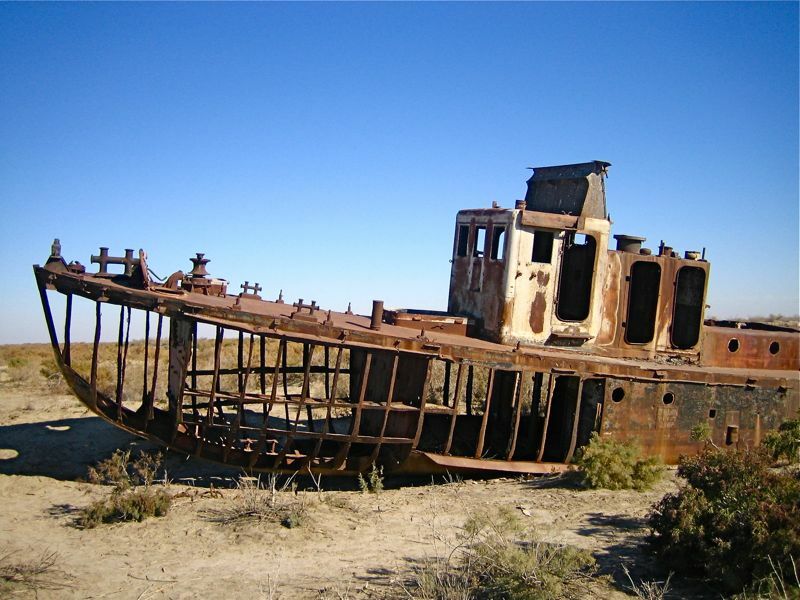 I’ve read about the Aral Sea. This place is one of the worst environmental disasters anywhere on the planet. 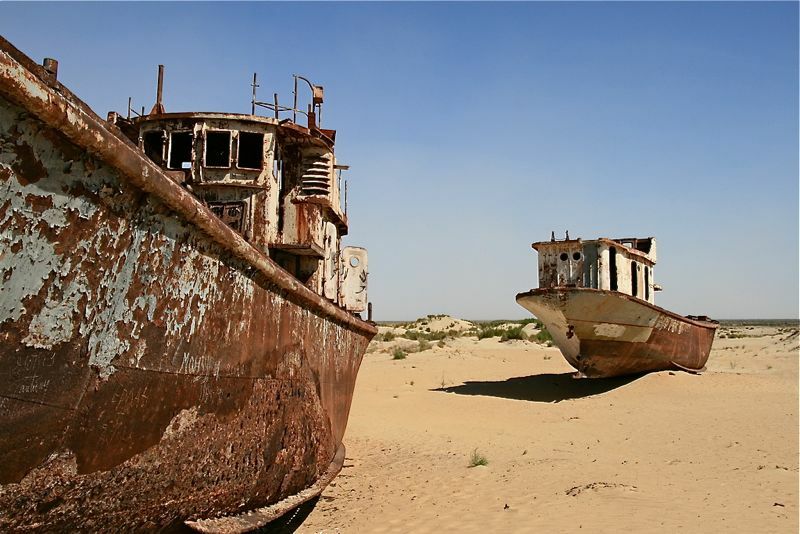 The drying-up of the Aral Sea is truly a great human tragedy and an ozymandian monument to the folly of trying too hard to out-do nature. However, I’m encouraged to hear that there is now an effort to restore the sea. I hope it’s a success. 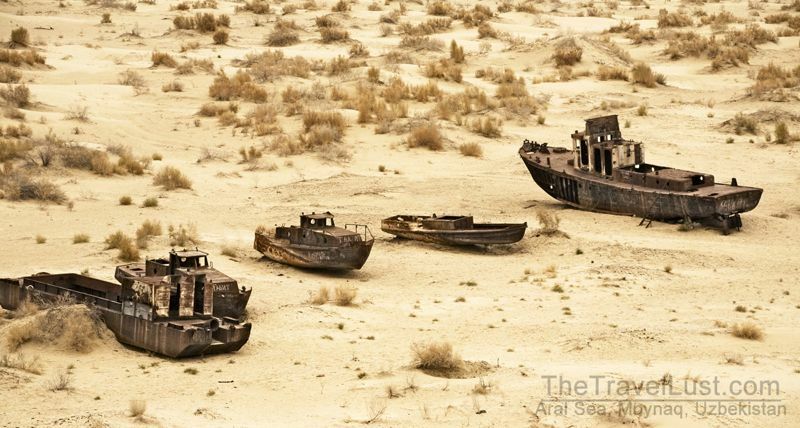 A fleet of decaying ships in the middle of a desert does make a fascinating image.